This adorable, easy to read book is like a third grade level combination of a Junie B. Jones and Amelia Bedelia. There are the same type friendships as in Junie B. and similar misunderstandings like you find with Amelia Bedelia. Sometimes you can understand how she could misunderstand words like Mrs. Carrot instead of Mrs. Carrick. Of course, other times, it seems that she just likes to be different, calling yoga class yogurt class. 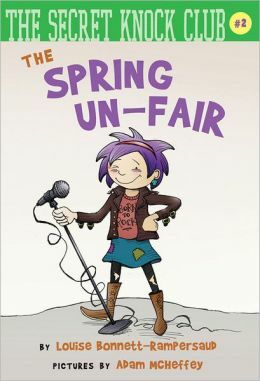 This is a great problem solving book as Agnes and her friends must come up with a way to raise money to provide a dunk booth for their school’s spring fair. They decide to give a concert and Agnes names herself the lead singer for their rock band. She and Fudgy must overcome a pretty serious case of stage fright. Fortunately, they have the help of their music teacher, Mrs. Roman. Unfortunately, the day of the concert Agnes comes down with a very bad case of laryngitis. But, Fudgy’s older brother has a band of his own and with a little bit of pleading, Agnes and her friends are able to convince Reggie and his band to perform so the concert can go on. It was a great show! Agnes and her friends, with a little help from Reggie and his friends, were able to raise enough money to turn the spring un-fair into a spring fair. Problem solving, overcoming fears, and working together are just a few of the social lessons to be learned. 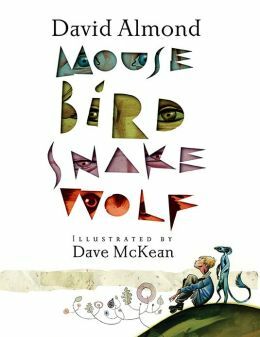 Using this book as a read aloud would give the teacher numerous opportunities to help students gain valuable inference skills. There are plenty of possibilities for creative writing prompts. “What would you do if you needed to raise money for your school?” And then there are the math possibilities. “If a dunk tank costs $150, how much could you charge and how many tickets would you need to sell to raise enough money?” Other great uses for this book include guided reading groups and literature circles. Any child who loves Junie B. Jones will also love Agnes. They are two peas in a pod. The Secret Knock Club and the rock band will appeal to both boys and girls. But, parents beware. You may end up with a rock band in your garage. Soon Charlie is making some teensy-weensy changes. And before you know it, as he spends more and more time with Mr. Flux, Charlie is not only making change but encouraging his family and neighbors to change too. The lesson in this story is heavy handed at times, with a full spread of quotes in support of change. 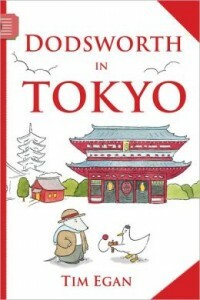 But the whimsical illustrations and absurd behavior of the book’s characters coat the lesson with the type of sugar that third grade readers will love. The message also comes in layers, addressing everything from art appreciation to friendship between people who confuse and puzzle each other. And a surprising twist at the end increases reading comprehension with a fun play on words. In a note from the author at the end of the book, readers are introduced to “Fluxus” an art movement that started in the 1960s and “brought together artists, filmmakers and musicians from all over the world who shared a love of humor and playfulness and change.” In this sense, the author and illustrators have done a great job of showing Fluxus in action and encouraging readers to look at the world around them in a new way. Animal Helpers: Sanctuaries is more than a picture book for the kindergarten to third grade level reader. This book is a fun and informative study of who and how animals can be helped and cared for. Many times exotic animals are purchased when they are tiny, but when they grow and become too big for their caregiver, who takes over the care? 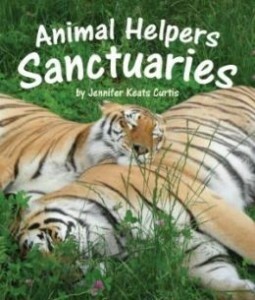 Animal Helpers: Sanctuaries is the book to launch those discussions and learning. Educators and parents will appreciate the clear information presented in the book for the kindergarten through third grade reading level students. Whether the book is read aloud or students study it independently, the beautiful pictures will help tell the story of a bear, a lynx, two tigers, and a variety of other beautiful and exotic animals that cannot live alone in the wild. The publisher has numerous resources for teachers on their website and the book includes four pages of activities to do at home or in the classroom. Readers will learn hands-on about sanctuaries and the care of animals, rescue and habitats, and how to identify domestic animals from those that should be wild. Many more free learning activities are available online at www.SylvanDellPublishing.com. 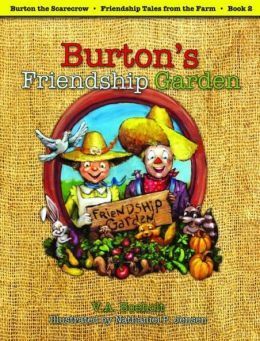 This is a great book to add to the classroom or the homeschool library but it also is a good book for parents to read and share at home. Summer reading can open discussions about animals, the environment, and even volunteer opportunities available for children who love to know more about helping animals. The additional pages for “Creative Minds” are a plus for parents and teachers offering a wide variety of fun learning experiences to share with the third grade student. 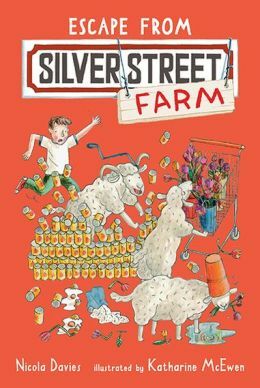 Three animal-loving children, Meera, Karl, and Gemma, get together to form a farm within the city. They love every aspect of developing a farm—even shoveling poop– alongside Flora MacDonald, a young Scottish farmer whose experience in farming is invaluable. As they prepare for the Grand Opening, they hear the results of the constant head-butting of their latest arrival, Kenelottl Mossworthy Merridale (Kenny, for short). Despite the noise, the children think everything is set until Flora announces that their prize attractions, the always-nervous turkeys, have flown the coop. As if that isn’t bad enough, Bobo and Bitzi, the Silver Street sheep—formerly known as poodle puppies—have also disappeared. Since the sheep are the newly arrived ram’s new wives, it is only sensible that the children use him to sniff them out. With the sheep in the grocery store and the turkeys about to take a frightening ride in a bouncy castle over the dam, life is exciting for all involved! But is the mystery solved? Not yet! There’s still the matter of the unexplained hole in the fence and the hidden tunnel. Enter Bish Bosh and Squirt for some additional entertainment. As the sequel to Welcome to Silver Street Farm, Escape from Silver Street Farm is the second in a series of six books. Full of humor, the series should appeal to animal lovers at the third grade reading level. If teachers like the idea of teaching children the value of taking charge with the aid of a supportive adult or two, this book should definitely be added to their reading list. When a cake is stolen from a cake contest and there are twelve possible suspects, who do you call? Duck, the deductive detective! He assesses the situation and one by one eliminates suspects based on the evidence. 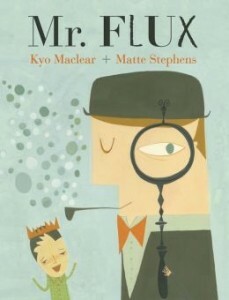 The Deductive Detective is a charming read-aloud, but for a third grade class to really appreciate the puns, students may also read it individually. Brian Rock, a former educator himself, also writes allusions throughout his book. To understand puns like the Elephant’s statement, “I come from a long line of Tudors”, or cow’s recollection that her great-grandmother once “jumped over the moon,” students must remember who the Tudors were or a nursery rhyme. As a comprehension activity, students may be asked to pick two puns and explain them as if teaching an English as a Second Language (ESL) student. This type of activity promotes comprehension of the text and empathy for ESL students. This book is also a fantastic book to bridge literacy and math concepts. The overlap of the math concept subtraction and the process of elimination are clear. As another extension activity to help students understand the concept of deductive reasoning, students may play the games like “Guess Who,” “Battleship,” or “Twenty Questions.” Each of these games requires students to use clues and the process of elimination to reach the solution to a problem. Literacy and problem solving skills are two of the most crucial skills for students to acquire, and games along with The Deductive Detective are a fantastic way to learn. My Dad Thinks He’s Funny is a delightfully sarcastic book that almost any kid can relate to. For any child who has a parent whose first response to a complaint about a sore finger or foot is “just chop it off,” this book will provide plenty of giggles and eye rolling. 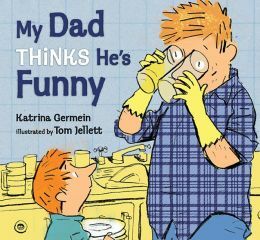 Katrina Germein perfectly captures the silly ways that many dads have of showing their love and humor. This book is a fantastic read aloud for a third grade class; it encourages skills in fluency and inflection to give more meaning to the text. This book seems like a natural fit in a unit about families or toward the end of year when students are thinking about Fathers’ Day. Teachers may have students fashion a card or gift for dads in a way that echoes the format of My Dad Thinks He’s Funny: recording an example of how their dads demonstrate certain traits or qualities. This book is a lovely gift for a special man at Father’s Day, bringing unity to the giver and receiver. As an art extension activity for this book, students may create illustrations in the same style as Tom Jellett. His multi-media illustrations are a unique combination of simple drawings and real materials. Students may start with easy combinations like markers and colored chalks on paper, or more advanced artists may move to combining these and raw materials like fabric and natural elements. To bring art and literacy together, students may even write and illustrate their own book! Whether for home or class, My Dad Thinks He’s Funny is a great addition to a book collection. Where does rubber for balloons and tires come from? Balloon Trees follows the process of harvesting latex from rubber trees, to shipping, chemical processing, vulcanization, and distribution of balloons. 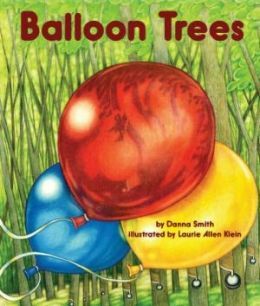 Dana Smith’s simplified prose may be a bit deceptive, for the ideas within Balloon Trees are anything but “simple”; her research and collaboration with rubber manufacturers is combined in this book to make a non-fiction description of the route balloons take from beginning to end. The extra information in the “For Creative Minds” of Balloon Trees also gives resources that allow teachers and students to take learning beyond the pages of Balloon Trees. Laurie Allen Klein illustrations are nothing short of stunning; the colors and textures bring to life the process of balloon manufacturing. Each illustration has a beautiful green bird that seems to be observing the different steps of balloon manufacturing, and in many of the illustrations, the bird imagery is echoed subtly, almost as a bonus seek and find. After reading Balloon Trees aloud with a third grade class, be prepared to research answers to more questions that students may have because this book provides just enough information to inform students about balloon manufacturing and to pique students’ appetites to understand the greater concepts of rubber use and manufacturing. In the back of the book, there are several ready-to-use resources, such as a sequencing game and a true or false comprehension quiz about rubber. Balloon Trees also gives readers access to myriad free online resources at Sylvan Dell’s website. These resources are an asset to any busy teacher who wants to give the best information and tools to students on their journey as life-long learners. This book is a natural fit in any third grade classroom library.